Space shuttle Endeavour, seen here in 2008 atop NASA's Boeing 747 carrier aircraft, will arrive in Los Angeles Sept. 20, 2012. NASA's space shuttle Endeavour will embark on a three-day journey by air this month that will take it from coast to coast on a mission to become a museum display. The space agency on Friday (Sept. 7) revealed Endeavour's final flight plan, announcing the route that its jumbo jet will follow as it carries the shuttle piggyback from Florida to California. The trip is set to begin on Sept. 17, weather permitting, at NASA's Kennedy Space Center in Cape Canaveral, Fla., and culminate at Los Angeles International Airport (LAX) on Sept. 20. From there, Endeavour will depart in October on a two-day road trip to the California Science Center. Before going on public exhibit, Endeavour's ferry flight will give the public and thousands of space program workers the chance to see the shuttle as it flies over seven states and eight of NASA's facilities. 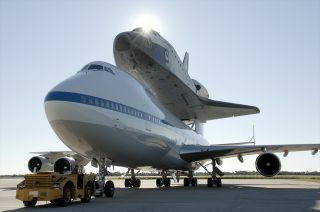 The space agency's Shuttle Carrier Aircraft (SCA), a modified Boeing 747 jetliner, will touchdown near the Houston home of Mission Control and visit the shuttle's West Coast landing site before flying by California landmarks including the Golden Gate Bridge and the Hollywood sign. Using a gantry-like steel structure called the Mate-Demate Device, Endeavour will be hoisted off the ground by crane so the jetliner can be positioned underneath it. The shuttle will then be lowered onto the SCA's back and secured for flight. At sunrise on Sept. 17, the aircraft and shuttle combo will take off and fly over the Space Coast, including Kennedy, Kennedy Space Center Visitor Complex, Cape Canaveral Air Force Station and Patrick Air Force Base. Endeavour is expected to fly south over Cocoa Beach and north over Merritt Island before heading west. Coordinating with the Federal Aviation Administration, the SCA will perform low flyovers — as low as 1,500 feet (457 meters) — as it passes NASA's Stennis Space Center in Mississippi and the agency's Michoud Assembly Facility in New Orleans. Stennis tested the orbiter's main engines and Michoud is where the shuttle's iconic orange external fuel tank was constructed. Endeavour will then continue westward, descending again to perform low passes over areas around Houston, Clear Lake and Galveston in Texas before making a landing at Ellington Field near NASA's Johnson Space Center. Weather permitting, the SCA and Endeavour will remain at Ellington for the remainder of the day and all day on Sept. 18, providing Johnson employees and the Houston public an ample opportunity to see the shuttle. The orbiter and aircraft will take to the air again at sunrise on Sept. 19, and after a brief refueling stop at Biggs Army Airfield in El Paso, Texas, will conduct low-level flyovers of White Sands Test Facility near Las Cruces, N.M., and Dryden Flight Research Center at Edwards Air Force Base in California, before landing around mid-day at Dryden. Both White Sands and Edwards served as landing sites for the shuttle during the orbiters' 30 years returning from space. White Sands also serviced the shuttles' thrusters between flights and Edwards' dry lakebed supported the orbiter's late 1970's approach and landing tests. Finally on the morning of Sept. 20, Endeavour, still on top of the SCA, will take off one last time, departing Dryden to fly over Northern California, passing above NASA's Ames Research Center at Moffett Field and various landmarks in multiple cities, including San Francisco and Sacramento, the state's capitol. The carrier aircraft will fly near one last NASA center, the Jet Propulsion Laboratory in Pasadena before performing flyovers over many Los Angeles landmarks on its way to a landing at LAX. A ceremony scheduled for 11 a.m. PDT (1800 GMT) will welcome its arrival. Endeavour's transcontinental trip is short when compared to the 122,883,151 miles (197,761,262 kilometers) that the shuttle traveled while circling the Earth 4,671 times during its 299 days in space. But it is a big endeavor in contrast to NASA's other space shuttle museum deliveries. Both Discovery and the prototype orbiter Enterprise were also delivered for display on top of NASA's SCA, but their flights to northern Virginia and New York City in April were non-stop and each was completed in less than a day. Endeavour's longer journey leaves it more susceptible to changing weather conditions and operational constraints. According to NASA, some of the flyovers or layovers that are planned could be delayed or cancelled as a result. Even after Endeavour is on the ground in L.A., a final leg will remain on the shuttle's itinerary. After being removed by cranes from the SCA and spending a few weeks at a United Airlines hangar to be prepared for its transport and display, Endeavour will travel through Inglewood and Los Angeles city streets on a 12-mile road trip from the airport to the California Science Center, arriving in the evening on Oct. 13. Beginning Oct. 30, the shuttle will be open to the public on display in the science center's new Samuel Oschin Space Shuttle Endeavour Display Pavilion, embarking on its new mission to commemorate past achievements in space and educate and inspire future generations of explorers. Follow collectSPACE on Facebook and Twitter @collectSPACE and editor Robert Pearlman @robertpearlman. Copyright 2012 collectSPACE.com. Allrights reserved.